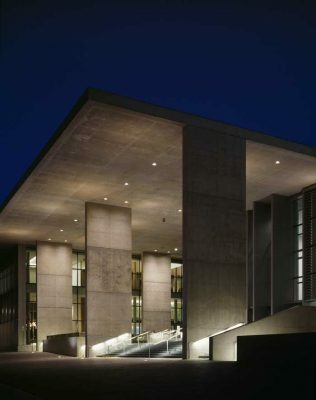 The Grand Rapids Art Museum – GRAM – features a unique design that compliments its prominent location with a grandeur urban gesture while offering an intimate atmosphere to enjoy the arts. The new Grand Rapids Art Museum occupies one city block right in the heart of Grand Rapids, Michigan. Grand Rapids is a city well known for its legacy and influence on commerce, craft and modern design and it is the home to many international companies – AmWay, Steelcase, Herman Miller, Haworth, among others. The new museum has 125,000 SF of floor area with more than 50,000 SF of gallery and art exhibition spaces. The new building is located adjacent to the park with sculpture “Ecliptic” by Maya Lin, forming an urban oasis surrounded by tall buildings. The design stresses both the symbolic need of a museum to be a civic icon within the city, plus fulfilling humanistic needs for people to have their own experience with art. It is grand in its presence, and intimate in the experience, working in harmony. Floating canopy: A frame of the city and a place for all. The projecting canopies, like large canopies of trees extend up and reach out to frame the park and the city, similar to the Japanese concept of “borrowed scenery”. The sheltering canopy defines a place for multiple urban activities, as a gathering place for people. The front of the building is formed like fingers extending into the green of the park. Museum lobby, restaurant, education center are projecting pavilions towards the park with pockets of nature between them. Arriving in the museum, pockets of nature between museum pavilions slow people down from hectic pace of urban life. The presence of nature within allows the visitor to reach a state of repose, adjust their eyes and conscience state for the art to come. Layers of screening – louvers, glass and shades soften the light and calm the mind. The inner sanctum beyond is the 3-level gallery tower where top floor galleries are lit with lantern skylights, serving as light givers to the galleries as well as illuminating “beacons” in the urban night sky. Light truly breathes in the gallery- the changing of time is sensed in the changing light of the galleries. 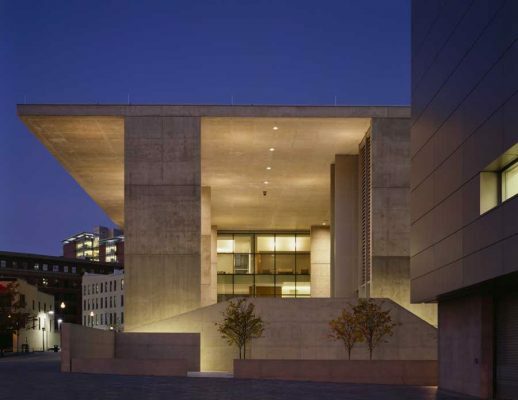 Being one of the very first art museums in the US designed with the goal for LEED certification, the use of natural light in the building is carefully planned. Most public areas of the museum have natural light, and gallery rooms welcome light from top lantern skylights as well as large windows which also connect art to surrounding urban life. 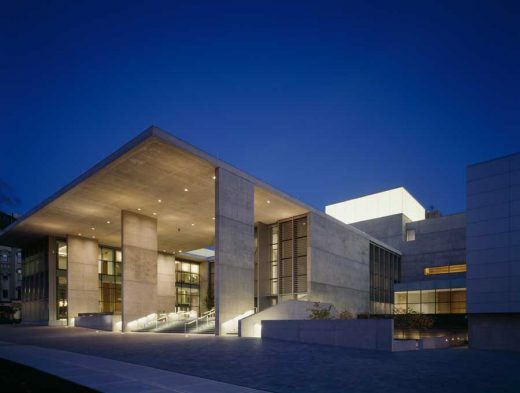 Grand Rapids Art Museum’s design emphasizes the important balance of both the exterior openness and the interior calmness, both people’s needs to connect and also their needs to take inner joumeys with the arts. Both for people to enjoy the uplifting quality of light in the galleries as well as for them to enjoy wonderful outdoor time under the canopy. • Designed with optimum building footprint leaving parts of the land as park, courtyards and water feature. • Encourages public transportation, with bicycle racks and showers in the facility. • The front of the museum is a large canopy 140 feet wide and 120 feet deep to shelter people and activities in the open space below. • The new museum stores and recycles rainwater and uses the recycled water for toilet flush, irrigation for plants and for water feature and waterfall wall. • Designed to reduce heat island effect for the city. • Designed with optimum energy performance, with efficient insulation. • Take advantage of natural light with windows and skylight. 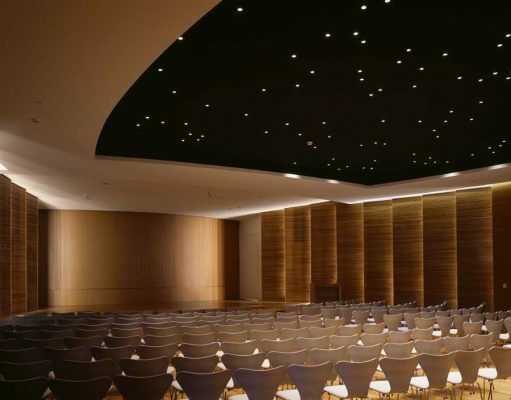 • The 3 main galleries (lantern galleries) employ lantern skylight for natural light. The lantern skylight has 3 layers of glass wall and 1 layer of scrim. • The new museum has an innovative air-conditioning system. It employs 3 of 12-feet diameter large energy wheels to bring in fresh air with minimal energy use. • Use indirect evaporative cooling method for air-conditioning. • Employ Ozone depletion policy with no HCFC in building systems. • Will be operated with energy monitoring system. • The construction of the new museum has careful waste management. • More than 10% of overall construction materials are recycled materials and many are also easily recyclable after its use. • More than 20% of all construction materials are materials from local sources (within 500 miles). • Wood products come from environmentally responsible sources certified by the Forest Service Council. • The new museum will have strict recyclable policy in operation. • The new museum will be a no-smoking facility. • The new museum has strict Carbon dioxide monitoring in all major areas. 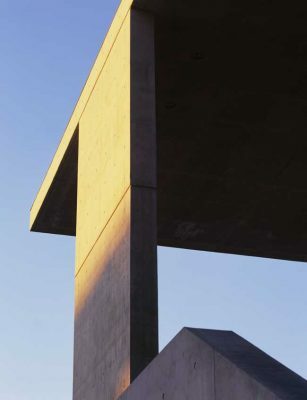 • The new museum significantly uses low-emitting materials. • The construction of the new museum has strict Indoor Air Quality management. • The new museum will have strict policy on Indoor chemical / pollutant control. • The new museum will educate the public about the building and the environment. • The new museum will have green housekeeping policy. • The new museum has LEED professionals working on the project.